It was typed by Joyce M. Ranieri in October 2005. McLellan used a / to represent a line break. That formatting has been retained in this transcription. Isaac ALLEN, died Feb. 25, 1845, AE 78 yrs. Sally BEDLOW / wife of / Isaac ALLEN / died / Sept. 13, 1851 / AE 78 years 2 mo. / & 15 days. Jennie M. GRISDALE, 1865 - 1939, Wife of Charles E. ALLEN. Caroline M., daughter of M. H. & C. ANTHONY, died Sept. 18, 1848, AE 4 years 11 days. George W. ARMSTRONG, born Apr. 27, 1841 - died Nov. 8, 1915. His Wife, Sarah J. HODGSON, born Nov. 10, 1839 - died Jan. 3, 1928. F. C. AGNEW, Apr. 25, 1872, Nov. 8, 1936. Elizabeth M., born Nov. 8, 1877, died Mar. 20, 1895. Nathan AVERILL, died April 16, 1865, AE 92 yrs. Polly, his wife, died Sept. 3, 1865, AE 87 yrs. Charlotte, wife of H. K. AVERILL, died Dec. 17, 1853, AE. 36 years. Clarence W., son of H. K. AVERILL, died Feb. 7, 1853, AE. 2 years 6 months. Catherine M., dau. of H. K. AVERILL, died Feb. 1854, AE 9 months. Edgar AVERILL, born July 10, 1826, died Apr. 10, 1870. Abbie M., his wife, born Jan. 1, 1829, died Jan. 15, 1888. 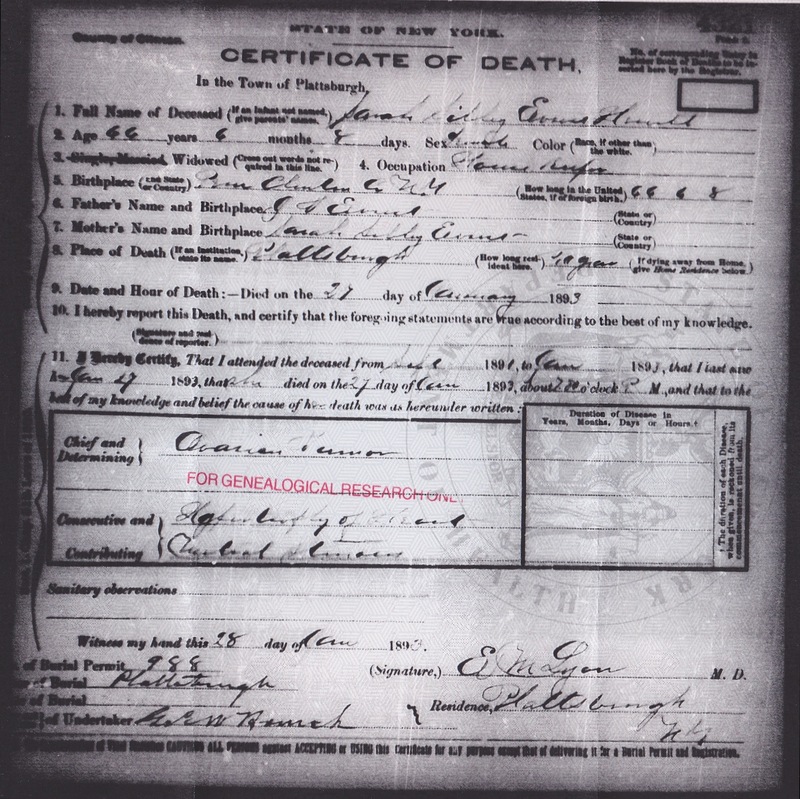 Charles F., son of G. F. & K. L. AVERILL, born Apr. 12, 1878, died Dec. 5, 1880. John Boyle GILMORE, born Sept. 2, 1842, died Jan. 13, 1885. Clarence Fulton WHITE, 1856 - 1914. Lura AVERILL GILMORE WHITE, born Apr. 1, 1857, died Feb. 14, 1933. Edgar William, born Nov. 24, 1876, died Nov. 6, 1881. Lura Nathalie, born Oct. 27, 1880, died Apr. 2, 1882. Children of J. B. & L. A. GILMORE. George O. BACON, died June 7, 1895, AE. 65 years. Anna BACON HAAS, died at Washington, D.C. Sept. 18, 1906, AE 56 years. Samuel Pitcher BAILEY, born Oct. 26, 1825, died Jan. 16, 1872. Ellen M. DeFORRIS, wife of S. P. BAILEY, born Sept. 12, 1829, died Dec. 4, 1901. Truman D. BAILEY, born Sept. 27, 1854, died Oct. 29, 1888. James F. BAILEY, born Oct. 29, 1852, died Mar. 22, 1924. Edith P. BAILEY, his wife, born Mar. 5, 1854, died Oct. 18, 1938. Samuel P., Jr., born Feb. 8, 1856, died Oct. 12, 1861. Lucy Matilda, born Dec. 19, 1861, died Aug. 14, 1862. Willie, born Aug. 2, 1863, died Aug. 29, 1863. Children of S. P. & E. M. BAILEY. Lucinda BAKER, died May 5, 1874, AE 78 yrs. Hannah E., daughter of Alvin & Amarille (sic) BAKER, died Nov. 25, 1841, AE 12 years. Everett C. BAKER, 1834 - 1918. Erie W., his wife, 1837 - 1901. Emma, daughter of E. C. & E. W. BAKER, died Nov. 1, 1861, AE. 16 months. Alvah B. BALCH, born Apr. 18, 1796, died Mar. 5, 1871. Mary McARTHUR, wife of Alvah B. BALCH, born Apr. 11, 1801, died Sept. 21, 1873. Ebenezer BALCH, born Aug. 31, 1766, died Dec. 31, 1846. (NOTE: marker: "Rev. Soldier Ebenezer BALCH 1766 - 1846"
Sarah BIRCHARD, wife of Ebenezer BALCH, died Oct. 23, 1852, AE 84 years 3 months. Galusha B. BALCH, born Feb. 6, 1839, died Apr. 8, 1919. Harriet C. ANDREWS, wife of Dr. G. B. BALCH, born Dec. 8, 1837, died May 30, 1924. Fredrick (sic) A., son of G. B. & H. C. BALCH, died Aug. 2, 1869, AE 7 months 18 days. Samuel Weed BALCH, born Jan. 18, 1862, died July 19, 1940. Edmund Ezra BANKER, 1850 - 1915. Emily Signor BANKER, 1858 - 1944. Ethel DAVIS BANKER, 1886 - 1929. Charlotte M., dau. of B. D. & Phebe E. BANTER, died Nov. 21, 1842, AE 11 years 6 months. Roswell Oscar BARBER, 1814 - 1898. Sabrina RANSOM, his wife, 1817 -1902. Margaret BARBER, Mar. 26, 1838, June 29, 1914. George E., son of John & Phebe BAXTER, died Sept. 29, 1852, AE 9 months. Hiram Jackson BENTLEY, born Apr. 16, 1807, died Apr. 10, 1862. Hannah Louise FOUQUET, his wife, born Feb. 6, 1807, died July 14, 1868. John H. BENTLEY, 1865 - 1925. Harrison BIDGOOD, born Aug. 21, 1840, died Oct. 22, 1898. Horace H., son of S. D. & Relief CLAISDELL, died Dec. 28, 1841, AE 3 years, 1 month, 5 days. Cevedre D., son of Charles & Anna BLAKE, born Sept. 10, 1820, died Sept. 11, 1871. Charles BLAKE, died Jan. 17, 1847, AE 51 (or 57) yrs. Anna COOK, his wife, died Apr. 14, 1862, AE 63 yrs. Jane E. BLAKE, born July 25, 1829, died Jan. 30, 1882. H. Pierpoint, son of Charles & Anna BLAKE, died at Woodstock, Vt., Aug. 29, 1832, AE 14 yrs. Carrie L., wife of Jacob BLAND, died May 15, 1881, AE 19 years 7 months 17 days. Thomas A. M., son of J. & C. L. BLAND, died Aug. 24, 1881, AE. 4 months. Edna E., daughter of J. H. & S. C. BOND, died July 18, 1882, AE 5 months. Grant H., son of Henry & Edythe BOURDEAU, born Nov. 30, 1941, died Oct. 4, 1943. John BRACKETT, died Jan. 8, 1833, AE 41 years. Josiah, Jr., son of Josiah & Mary BRACKETT, died Apr. 7, 1833, AE 6 months. David BREWSTER, died Apr. 27, 1869, AE. 74 yrs. Little Wattie, son of G. H. & H. E. BREWSTER, died Aug. 4, 1869, AE. 9 mo. Jennie died Aug. 17, 1866, AE. 7 yrs. 3 mo. Mattie died Jan. 21, 1867, AE. 5 yrs. 3 mo. Children of Geo. H. & H. E. BREWSTER. Aretus J. BRISTOL, died Aug. 4, 1883, AE. 81 years. Maud Althea, daughter of E. N. & E. M. BRISTOL, 1882 - 1892. James BRISTOL, died April 11, 1879, AE. 38 years. Anna WALLIS, wife of James BRISTOL, died July 18, 1871, AE. 26 years. David BROCK, died Aug. 13, 1851, AE 65 years 11 months. Philena ALBEE, wife of David BROCK, died Mar. 17, 1871, AE. 81 years. Lorenzo D. BROCK, died Dec. 14, 1867, AE. 58 years 11 months. Anna WILBER, wife of Hallock BROMLEY, died Feb. 17, 1852, AE 63 years. Charlie, son of J. H. & H. D. BROMLEY, died Nov. 23, 1865, AE 7 months & 5 days. Barton H. BROOKS, Aug. 18, 1933. Henry W. BROWN, / died Oct. 22, 1842, AE 25 yrs. William G. BROWN, died at Ticonderoga, N.Y., Mar. 19, 1884, AE. 76 yrs. Elizabeth H. BROCK, wife of Wm. G. BROWN, died Feb. 2, 1871, AE. 60 yrs. John Clark, 3rd son of Wm. G. & Elizabeth H. BROWN, died July 6, 1842, AE. 3 yrs. 11 months. Sophia Elizabeth, only daughter of Wm. G. & Elizabeth H. BROWN, died Sept. 5, 1832, AE 1 yr. 3 months. Chas Wesley, 5th son of W. G. & E. A. BROWN, died Feb. 8, 1845, AE 1 year 2 months. Orpha, 3rd daughter of W. G. & E. A. BROWN, died July 15, 1849, AE. 3 months. Hannah T., wife of Rev. S. D. BROWN, died Feb. 4, 1847, AE. 31 years. Joel BUCK, died May 27, 1831, in the 73 year of his age. Huldah BUCK, died May 27, 1831, in the 73 year of her age. Elizabeth AVERILL, wife of Perrie E. BURCH, 1831 - 1922. Bert L. BURRITT, 1871 - 1939. His Wife, Helen L. LANSING, 1876 - 1944. Joshua BUZZELL / died / Sep. 11, 1842, AE. John S. CADY, died Dec. 7, 1876, AE. 36 yrs. 3 m.
Cyrus CADY, died Jan. 18, 1865, AE. 68 yrs. 5 m. 24 d.
His Wife, Hannah R. BLINN, born July 14, 1851, died Aug. 28, 1920. Rufus M. CALKINS, born Apr. 1843, died Jan. 1932. Fannie WINTERBOTTOM, his wife, born Aug. 1853, died Nov. 1915. Richard CALKINS, died Feb. 24, 1891, AE. 83 years. N. Lovesta HALL, wife of Richard CALKINS, died July 26, 1883, AE. 67 years 6 months. C. H. CALKINS, born Jan. 29, 1841, died Aug. 19, 1899. Mary A. McGREGOR, 1847 - 1930, wife of C. H. CALKINS. Florence CALLANAN, 1908 - 1933. Avis H., wife of Billings CARPENTER, died Jan. 4, 1842, AE. 49 years. E. Susan S., wife of Thomas CARPENTER and daughter of Joseph WIGGINS, Esq., Portsmouth, N.H., died Feb. 14, 1845, AE. 32 years. Hosea CHAMBERLIN, died May 15, 1841, AE. 60 years. Wm. H. CHAPPEL, born Apr. 24, 1814, died Feb. 17, 1879. Zenas CLARK, born at Haddam, Conn., Nov. 25, 1792, / died May 20, 1874. Sarah WALLING, wife of Zenas CLARK, born in Canaan, Conn., Nov. 25, 1791, died Dec. 26, 1885. Jennie Kate, beloved child of adoption, born Apr. 30, 1860, died Mar. 7, 1884. Daughter of the late Gen. S. F. & K. H. JUDD, of Ogdensburg, and adopted daughter of Mr. & Mrs. E. T. STRATTON. Rosian A. CLARK, wife of Edward STRATTON, born Apr. 10, 1821, died Dec. 17, 1903. Ida Rosina, daughter of Darius & Mary J. BUSHNELL, died June 28, 1878, AE. 18 yrs. "Thy gentle memory is not dim, in the deep hearts that loved thee." Belle Mary Isabella, daughter of Geo. J. & J. W. CLARK, born Feb. 8, 1854, died Jan. 5, 1862. M. Anne, daughter of W. A. & D. CLINGMAN, died Sept. 23, 1853, AE. 20 months. Rev. Joseph Howland COIT, D.D., For twenty-six years Rector of Trinity Church, Plattsburg. Born November 3, 1802, Died Oct. 1, 1866. Jane Harriet COIT, born Dec. 3, 1804, died Nov. 3, 1893. Mary Josephine, 1870 - 1933, Daughter of John E. & Harriet Jane WHITE. Harriet Jane WHITE, wife of John Elijah WHITE, only daughter of the beloved parents by whose side she is buried. Born Sept. 25, 1842, died Nov. 7, 1896. James Milnor, son of Rev. J. H. COIT, died Apr. 5, 1833, AE. 1 year 7 months. Mary CONSTINE, died Jan. 19, 1896, AE. 53 years. William COOKE, 1852 - 1915. Charlotte BARTLEY, wife of William COOKE, 1850 - 1913. Lizzie F. COOKE, died Oct. 25, 1891, AE. 14 years 6 months. Levi COOLEY, died May 30, 1875, AE. 81 years 9 months. Mary BUXTON, wife of Levi COOLEY, born May 3, 1797, died Jan. 4, 1877. John COOLEY, died May 16, 1905, AE. 75 years. Edward COOLEY, 1832 - 1881. Elizabeth, wife of Arthur B. COOLY, died Aug. 23, 1846, AE. 29 years. Also Elizabeth Maria, her infant daughter, died Aug. 3, 1847. Eliza R., daughter of L. & M. COOLEY, died Mar. 23, 1866, AE. 38 years 6 months 21 days. Sophia A., daughter of Levi & Mary COOLEY, died Jan. 15, 1858, AE. 12 years 8 months. Levi M., son of Levi & Mary COOLEY, died Mar. 7, 1844, AE. 19 months. Mary Frances, died July 30, 1844, AE. 9 months 21 days. George, son os R. & M. A. COTTRILL, died July 20, 1847, AE. 6 weeks. Thomas, son of R. & M. A. COTTRILL, died Dec. 17, 1852, AE. 2 years. Darling Willie, son of J. H. & H. L. COTTRILL, died Apr. 29, 1871, AE. 2 years 5 months. Samuel COUCH, died Dec. 3, 1879, AE. 86 years. Mary L. PARKER, wife of S. COUCH, died Apr. 20, 1867, AE. 72 years. Margaret M. Y. VEEDER, adopted daughter of S. COUCH, died July 31, 1852, AE. 16 years. Irene SAWYER, wife of S. COUCH, died Feb. 4, 1877, AE. 62 years. C. J. L. CRAMER, born Oct. 19, 1825, died Aug. 2, 1899. Maria S. GREGORY, his wife, born July 26, 1829, died Nov. 3, 1907. John C., son of C. J. L. & S. M. CRAMER, died Mar. 20, 1861, AE. 8 years 1 month. James L., son of C. J. L. & S. M. CRAMER, died Jan. 8, 1874, AE. 16 years. Libbie A., daughter of C. J. L. & S. M. CRAMER, died Jan. 14, 1874, AE. 13 years. Lucy F., daughter of C. J. L. & S. M. CRAMER, died Jan. 13, 1874, AE. 11 years. Mabel E., daughter of G. F. & P. M. CRAMER, died Nov. 20, 1897, AE. 4 months. Fred H. CRAMER, Co. E., 22rd (sic) Reg. N.Y. Vol. Inf. 1844 - 1912. Jennie L. DUNDAS, his wife, 1843 - 1874. William A. CROOKS, 1851 - 1922. Edward M. CROSBY, born Aug. 4, 1812, died Sept. 8, 1880. Caroline PARKER, his wife, born Aug. 8, 1820, died Dec. 18, 1893. George PARKER, 1854 - 1855. Mary MYERS, wife of Wm. S. LANGDON, 1842 - 1894. William S. LANGDON, 1840 - 1878. Hiram Wolcott STETSON, born Sept. 24, 1835, died June 27, 1911. Eliza Dobie CROSBY, his wife, born Nov. 7, 1850, died Feb. 19, 1901. Darwin S. CULVER, 1865 - 1930. Alexander CURTAIN, born Aug. 4, 1823, died Apr. 3, 1888. John A., son of A. & C. CURTAIN, born June 25, 1855, died Nov. 19, 1873. Mary, wife of John CURTAIN, died Nov. 19, 1883, AE. 84 years. Catherine, wife of Robert HACKETT, died Feb. 8, 1874, AE. 74 years. Mary S., wife of A. DANFORTH, died Mar. 30, 1867, AE. 49 yrs. George W. DAVIES, born Dec. 17, 1862, died Oct. 14, 1890. Lucy M. GRANT, his wife, born Nov. 22, 1806, died July 9, 1891. Mary, born Nov. 10, 1831, died Aug. 12, 1833. Truman S., born July 12, 1844, died May 9, 1845. Children of Truman & Lucy M. DeFORRIS. L. M. DeFORRIS, 1839 - 1919. C. S. DeFORRIS, 1835 - 1889. J. G. DeFORRIS, 1834 - 1903. Esther A. FINCH, wife of J. G. DeFORRIS, born Oct. 29, 1835, died June 29, 1863. John Murry, (sic) their son, born Jan. 22, 1863, died Sept. 8, 1866. J. Murray, (sic) son of J. G. & E. A. DeFORRIS, died Sept. 8, 1866, AE. 3 years 7 months 19 days. Harriet A., wife of J. G. DeFORRIS, 1829 - 1908. John R. GRANT, died Aug. 23, 1846, AE. 34 years. Albertine E. WEEKS, wife of A. DEWER, died Apr. 2, 1900, AE. 69 yrs. David F. DOBIE, 1840 - 1900, Capt. Co. H, 118 Reg. N.Y. Vols. Josephine H., wife of John J. DROWN, born Dec. 26, 1825, died Nov. 3, 1884. Edith, daughter of J. J. & J. H. DROWN, died Dec. 12, 1878, AE. 22 years. Ede Maria, daughter of John J. & Josephine H. DROWN, died Mar. 29, 1848, AE 7 months 18 days. Bessie, daughter of J. J. & J. H. DROWN, died Dec. 16, 1862, AE. 21 years 2 months. W. Allen, son of W. A. & J. A. DROWNE, died Sept. 5, 1887, AE 2months 17 days. Millie D. LOBDELL, his wife, born Jan. 16, 1848, died May 27, 1925. Wm. H. DUNHAM, died at Albany, Aug. 27, 1851, AE. 26 years & 1 month. Erected by his wife Cornelia. Susannah, daughter of George N. & Susannah DUNTON, died Dec. 15, 1827, AE. 24 years 6 months. Orson J., son of David D. & J. P. DURGIN, died Nov. 4, 1890, AE. 22 years. Joseph DURKEE, 1803 - 1882. His Wife, Lury HODGKINS, 1805 - 1957. Daniel G., 1838 - 1862. Wolfred C., 1843 - 1867. Caroline F. W., 1834 - 1911. D. C. DURKEE, Co. B. 44th N.Y. Inf. Frankey E., son of R. A. & N. J. DUTTON, died Aug. 23, 1864, AE. 5 years 7 months. Jennie E. MANNING, wife of Sylvester EASTMAN, died June 8, 1874, AE. 28 years. Anna Mary STONE EDGAR, born Feb. 9, 1845, died Dec. 24, 1869. Gustavus Vasa EDWARDS, born Sept. 2, 1804, died Feb. 26, 1874. Augusta GOODNOW, wife of Gustavus Vasa EDWARDS, born Feb. 13, 1813, died Jan. 11, 1903. John Quincy EDWARDS, born Sept. 22, 1844, died Nov. 8, 1896. Emma V. C. EDWARDS, born Sept. 3, 1851, died Sept. 23, 1924. Selfridge COOKE, born July 7, 1871, died June 17, 1878. Florence DIMON, born Mar. 16, 1880, died Oct. 3, 1896. Children of J. Q. & E. V. EDWARDS. C. G. S. EDWARDS, born Mar. 2, 1833, died May 29, 1868. Jersha Buell MILLER, his wife, born Sept. 11, 1835, died Aug. 10, 1891. Joseph R. EMERSON, born Aug. 17, 1809, died Feb. 8, 1899. Elliott C. LOW, M.D., born Wesport, N.Y. Feb. 16, 1843, died Jan. 3, 1925. Anne E. EMERSON, wife of Elliott C. LOW, 1850 - 1938. Eliza M. LOW, daut., 1871 - 1909. Delia S. THOMAS, wife of G. H. E. 1839 - 1878. Gordon T. and Carrie S.
William L. EMERSON, 1854 - 1883. Ellen E. EMERSON, 1844 - 1860. George H. EMERSON, 2nd Lieut. Harris Lt. Cav. N.Y.S. Vol. died at Washington, D.C., 1839 - 1866. Emily Diann WHITE, wife of Joseph R. EMERSON, 1816 - 1889. Albert W. EMERY, 1853 - 1911. Mary C. EMERY, 1862 - 1942. Tho. FARMER, died Dec. 6, 1852, AE. 37 years 4 months 13 days. Ellen, wife of Tho. FARMER, died Jan. 25, 1860, AE. 41 years 14 days. Euretta, daughter of Thomas & Ellen FARMER, died Apr. 12, 1845 , AE. 2 years 8 months 16 days. Almira, daughter of Tho's. & Ellen FARMER, died Aug. 23, 1842, AE. 2 years. Charles J. FARRELL, born Oct. 22, 1832, died Mar. 12, 1883. Lucy R. ATWOOD, his wife, born Nov. 21, 1834, died Feb. 14, 1913. William A. Their Son, Apr. 6, 1858, May 4, 1884. Benjn FASSETT, died May 8, 1842, AE. 62 years. J. C. FAUNTLEROY, 1888 - 1921. Frank FIFIELD, 1896 - 1941. William Henry FINN, born 1842, died June 2, 1893. Jewett P., son of W. H. & H. E. FINN, died Aug. 28, 1879, AE. 4 years. Lulu, daughter of W. H. & H. E. FINN, died Feb. 13, 1876, AE. 2 years & 7 months. Edward L. FISHER, Dec. 30, 1857, Feb. 3, 1916. Sadie I. FISHER, Apr. 14, 1864, Aug. 27, 1928. Isaac FOOT, / died Dec. 25, 1821, in the 32 year of his age. I. Platt FOOT M.D. died Mar. 22, 1880, AE. 54 years. Ann E. BAILEY, wife of Dr. I. P. FOOT, died Aug. 3, 1864, AE. 32 years. Mary SAWYER MOORE FOOTE, wife of the late Dr. Austin THOMAS, 1844 - 1926. Austin THOMAS, M.D., 1843 - 1922, Alumnus of Colby & Bowdoin, A Civil War Veteran, Married Mary E. NORTON 1873 and Mary SAWYER FOOTE 1897 An upright citizen esteemed by all. Lyman, son of Dr. I. P. & A. E. FOOT, born Aug. 6, 1861, died Aug. 9, 1862. Lois A. MERRIHEW, wife of W. H. FORDHAM, born Aug. 26, 1852, died Mar. 30, 1900. At Rest. Lucy, wife of Joseph A. FORKEY, died Jan. 6, 1867, AE. 40 Yrs. Wm. FRASER, died Apr. 1, 1882, AE. 26 ys. 5 mo. Joseph FREDERICK, died June 25, 1939, AE. 78 yrs. Martha, his wife, died Sept. 18, 1923, AE. 58 yrs. Jay Arthur FREEMAN, 1875 - 1939. Wilson, son of N. L. & H. M. GEBO, Nov. 19, 1918, Mar. 6, 1919. John Anderson GEORGE, / 1862 - 1938. Minnie Lincoln GEORGE, 1872 - 1938. Daniel GEROW, died May 17, 1860, in his 59 year. Mary GEROW, died June 9, 1897, AE. 90 years. Wm. GILLILAND, 1812 - 1886. Mary ELMORE, his wife, 1809 - 1882. Mary E., 1843 - 1926. Lot E., 1854 - 1918. Ann Maria, daughter of William & Mary E. GILLILAND, born Aug. 7, 1845, died Apr. 21, 1849. Charlotte PLATT, daughter of William & Mary E. GILLILAND, born June 11, 1847, died Feb. 11, 1839. Henry P., 1850 - 1924. William, son of William & Mary E. GILLILAND, a member of the 96 REgt. N.Y.S.V., died at Mill Creek Hospital, Fortress Monroe, Va.; June 7, 1862, from a wound received in the Battle of Fair Oaks, Va., May 31, 1862, aged 22 years. Minnie F., daughter of J. H. & M. E. GILLOTT, died Nov. 15, 1884, AE. 16 years. Mathew (sic) S. GILMAN, born Dec. 25, 1813, died Oct. 28, 1856, AE. 42 years. Sarah SEYMOUR, wife of Matthew S. GILMAN, & daughter of John NICHOLS, born Dec. 31, 1814, died June 27, 1843. Ann E. JERSEY, wife of Albert R. GODSO, born Sept. 4, 1835, died Aug. 23, 1903. Sarah Permelia, born Feb. 9, 1856, died July 31, 1871. Edmond Wesley, born Mar. 16, 1858, died Aug. 14, 1858. Infant Son, born Apr. 19, 1872, died Apr. 21, 1872. Truman Henry, born Oct. 19, 1873, died Sept. 14, 1874. Sidney GORHAM, born Oct. 14, 1804, died July 5, 1863. Lucy D. WINCHELL, wife of Sidney GORHAM, died June 1, 1896, AE. 84 yrs. 9 ms.
Wilbur F., son of L. D. & S. GORHAM, died Mar. 16, 1847, AE. 6 yrs. 3 mos. 13 days. Mary M., daughter of S. & L. D. GORHAM, died May 13, 1850, AE. 5 yrs. An Infant Daughter of Sidney S. & Sophia B. GORHAM, died June 22, 1832. Mason M., son of Sidney & Sophia B. GORHAM, died Dec. 25, 1838, AE. 1 year 12 days. Gracie, daughter of Ransom R. & Esther GRANT, died Nov. 9, 1879, AE. 6 years. Lorenzo Dow, son of L. & S. A. GRANT, died Nov. 12, 1839, AE. 17 yrs. 7 m. & 26 d.
George H., son of L. & S. A. GRANT, died Aug. 27, 1839, AE. 1 yr. 4 m. 7 d.
Jacob GRANT, Co. E, 16th N.Y. Inf. Joseph H. GRAVES, died June 8, 1892, AE. 80 years. Mary L. BENEDICT, wife of Joseph GRAVES, born Nov. 30, 1821, died Nov. 18, 1897. Nelson GRAVES, died Sept. 22, 1878, AE. 34 years. Fanny L. ZOTTMAN, wife of Nelson GRAVES, born Nov. 7, 1851, died Oct. 9, 1916. Alex. GRAVES, died May 16, 1894, AE. 43 years. Mary, daughter of Geo. H. & E. GRAVES, born June 4, 1898, died Dec. 9, 1899. William W. GRAVES, born Dec. 3, 1819, died Jan. 18, 1862. Cordelia E. WALKER, wife of William W. GRAVES, born Feb. 16, 1828, died June 18, 1900. Helen M. GRAVES, 1858 - 1934. Peter S. GRAVES, 1856 - 1916. Emma K. GRAVES, 1858 - 1928. Oliver GREGORY, died June 27, 1849, AE. 40 years. Abigail GREGORY, died Jan. 27, 1860, AE. 60 years. Andrew S. GREGORY, died May 17, 1863, AE. 32 years 6 months. Co. E 16 Regt. N.Y. Vol. Infant Son of Rev. & Mrs. T. H. GRIFFIN, 1875. Henry, son of John & Clara M. GRUBE, died Apr. 19, 1892, AE. 5 years. Jonathan T. HAGAR / born Mar. 14, 1823. Died Sept. 21, 1894. Little Josie H., daughter of L. & J. H. HAGAR, died Dec. 20, 1879, AE. 2 Y. 7 M. & 18 D.
Ella H. FLOWERS, wife of T. J. HAMBLIN, 1858 - 1885, AE. 27 years. Isaac M. HAMMOND, died Mar. 19, 1878, AE. 78 years. Hepsibeth M. FLINT, his wife, died July 5, 1870, AE. 70 years. James HAMMOND, born Sept. 25, 1824. Bertie, son of H. W. & A. S. HARRINGTON, born Nov. 28, 1878, died April 2, 1886. James I. HART, died Jan. 9, 1897. Isabel V. TOTMAN, his wife, died March 17, 1906. Mabel I., died Jan. 26, 1876, AE. 1 year 1 month. Nettie M. ANTOINETTE HATHAWAY, born Jan. 14, 1879, died Aug. 14, 1893. Pauline, wife of James HAYES, & daughter of Paul & Julia MONTVILL, died Mar. 20, 1867, AE. 17 yrs. & 9 mos. Benjamin W. HAYNES, died June 23, 1887, AE. 57 years. Caroline O. GALE, his wife, died Nov. 22, 1893, AE. 64 years. Mary Ruth, wife of Charles H. STACKPOLE, 1857 - 1919. Charlotte STACKPOLE, wife of William H. MASON, 1889 - 1935. Isabel M. A. BARKER, his wife, born Mar. 31, 1832, died Nov. 26, 1867. Mary A. BILLINGS, his wife, born Oct. 28, 1838, died Mar. 5, 1885. Alice J. CHUTE, wife of Edwin B. HEATH, 1864 - 1916. Willie, son of E. B. & A. J. HEATH, born Feb. 5, 1892, died Apr. 5, 1893. Abby DWIGHT, wife of Capt. Hiram B. HEDGES, died May 9, 1848, in the 22 year of her age. Catharine, wife of Oliver HENRY, who was born in the parish of Donnyclona, Ireland, and died at Plattsburgh the 18th day of Nov. 1842, AE. 46 years, 10 months, 6 days. Henry HERRON, died Mar. 3, 1902, AE. 72 years. Mary J., wife of Henry HERRON, died Aug. 20, 1877, AE. 43 years. Mary E., died Mar. 12, 1870, AE. 19 years. Alanson HIGBY, 1796 - 1871, A Soldier of 1812. Hiram F. HIGBY, 1838 - 1864, A Soldier of 1861. Joseph HOAG, Sargent Company C 22nd N.Y. Inf., 1841 - 1916. Elise L. CUTLER, his wife, 1849 - 1902. Jay D., 1893 - 1893. Francis Elizabeth, daughter of I.A. & R. G. HOLBROOK, died Aug. 3, 1842, AE. 3 mo. Cynthia Ann, daughter of Isaac & Electra HOLCOMB, died Jan. 9, 1833, AE. 15 years. Jane H. HOLT, died Nov. 29, 1842, AE. 58 Ys. James B. HOLT, died June 27, 1857, AE. 60 ys. Hannah, wife of James B. HOLT, died Mar. 27, 1866, AE. 67 ys. Hiram B. HOLT, Eld. Son of James B. & H. HOLT, died July 29, 1841, AE. 14 ys. Jacob H., second son of James & Hannah HOLT, died Oct. 5, 1846, AE. 17 ys. R. Johnson HOLT, born Mar. 2, 1834, died July 13, 1894. Byron Joscelyn HOLT, born at Massena, N.Y. Aug. 3, 1832, died at Plattsburgh, N.Y. Mar. 4, 1910. Mary Adeline, daughter of Byron J. & Mary D. HOLT, born Jan. 15, 1871, died Jan. 6, 1895. Harry S., son of Byron J. & Mary D. HOLT, died July 24, 1875, AE. 5 years 9 months. William Flagg HOLT, son of Byron J. & Mary D. HOLT, born Dec. 19, 1872, died Nov. 22, 1910. Sylvander V. HOWARD, born Aug. 1, 1830, died Aug. 3, 1891. Julia EDGERTON, wife of S. V. HOWARD, born Oct. 26, 1839, died Aug. 20, 1894. Sarah H. WILLSON, wife of S. V. HOWARD, died Oct. 11, 1876, AE. 45 years. Martha, wife of L. C. HOWE, died Feb. 28, 1841, AE. 35 years. Wm T. HOWELL, born Baltimore, Md., Mar. 25, 1843, died Plattsburgh, N.Y. Feb. 21, 1894. Sarah Frances CROSS, wife of Wm T. H., born Nov. 17, Washington, D.C. died Mar. 21, 1932, Plattsburgh, N.Y.
Howard H. HOWELl, died May 10, 1879. Wm. H. Harrison, son of Harris & Eliza HOYT, died June 21, 1842, aged 2 years & 10 days. Samuel HULL, died Aug. 30, 1846, AE. 52 years. Martin B., son of Hiram & Zilpha HYDE, died Aug. 5, 1834, AE. 3 years. Melissa PARISH, Wife of Peter JENETT, died May 29, 1907, AE. 76 yrs. 20 days. Sarah M., daughter of D. B. & S. M. JOHNSON, died Mar. 7, 1868, in her 39 year. Sidney R., son of H. S. & E. D. JOHNSON, died Mar. 17, 1856, AE. 8 m 6 d.
Charlott M. GILMAN, died Aug. 3, 1846, AE. 7 M.
Margaret A. GILMAN, died Jan. 30, 1849, AE. 15 years. Phebe M. GILMAN, died Apr. 7, 1842, AE. 12 yrs. Henry Smith JOHNSON, son of Henry S. and Elizabeth GILMAN JOHNSON, 1853 - 1941. Isabelle JOHNSON ULERY, daughter of Henry S. and Elizabeth GILMAN JOHNSON, 1857 - 1933. Frank Brainard JOHNSON, youngest son of Henry S. & Elizabeth GILMAN JOHNSON, 1861 - 1934. Henry M. JONES, born Sept. 8, 1831, died Apr. 12, 1911. Susannah E. CALKINS, his wife, born Mar. 30, 1838, died Mar. 9, 1906. Eliza, wife of Thomas JONES, died July 25, 1856, AE. 47 years. Mary FITZGERALD, 1878 - 1931, Wife of Herbert KEELER. William KENNEDY, born Feb. 29, 1848, died Juy 3, 1882. Sarah, wife of Thomas KENNEDY, died Aug. 3, 1850, AE. 37 years. Also Samuel, son of T. & S. KENNEDY, died Dec. 4, 1850, AE. 4 months. Nellie, died Mar. 9, 1862, AE. 16 years. Thomas, died Sept. 19, 1864, AE. 20 years. Children of T. & S. KENNEDY. Mary, wife of B. KETCHUM, died Feb. 23, 1849, AE. 61 yrs. Septa F., son of David & Fanny H. KENNON, (sic) died Jan. 23, 1856, AE. 23 years 11 days. Edward KIMMERLE, born Mar. 19, 1869, died Nov. 2, 1918. Duncan C. KINGSLAND, 1883 - 1943. Fannie V. KITCHELL, born July 17, 1825, / died Jan. 29, 1899. Joseph KRAMPIHOWSKY, Illinois, Master Sgt. U.S. Army, August 5, 1942.